Live rock music pummels the air, martinis flow, and the slot machines and blackjack tables are jammed with hopeful gamblers. It's just 7:30 on a Saturday night at the Seminole Hard Rock Hotel & Casino in Hollywood, Fla., just north of Miami, and cars are clogging State Road 7 below the Seminole Hard Rock's glowing towers, ready to disgorge even more players. But there's an added reason the Seminole Hard Rock complex is drawing such a horde of gamers these days: poker. Really high-stakes poker. Last spring, the Florida legislature changed the state's gambling laws to allow casinos and other gambling sites to eliminate the maximum bet a player can place to "buy in" to a poker game  a limit that just a few years ago was a paltry $2. As a result, venues like the Seminole Hard Rock, which is located on a Seminole Indian reservation and operated by the tribe, are suddenly magnets for professional poker players like Michael "the Grinder" Mizrachi, one of the best-known poker faces in Florida, who calls the state's new no-maximum rules "a dream come true. There's nothing better than playing poker with beaches." The World Poker Tour (WPT)  the series of televised poker tournaments that helped launch the big-time poker boom in 2002  agrees. Almost immediately after the law changed this year, the WPT swooped in and struck a deal with the Seminoles to hold a televised tournament next April at the Hollywood casino  where it will cost $10,000 just to sit at the table. Says WPT CEO Steve Heller: "I think Florida is destined to be one of the top three to five poker markets in the U.S."
Does that mean Florida is destined to become the next Nevada? Gambling is indeed expanding in the Sunshine State. The poker change came on the heels of a deal struck between the legislature and the Seminoles to give the tribe exclusive rights for five years to spread blackjack to most of its seven reservations  an arrangement that guarantees the recession-ravaged state at least $1 billion in revenue. Higher-stakes poker rooms are now sprouting up, not just at Indian casinos but also at more traditional Florida gambling sites like dog tracks, jai alai frontons and thoroughbred-horse tracks called "racinos." Although the sites still often set buy-in maximums, poker games these days can sometimes require a minimum bet of $50 and produce pots reaching the tens of thousands of dollars. Legislators say it's premature to envision Las Vegas in the Everglades. Vegas casino owners, like the proprietors of the Las Vegas Sands, are making pitches to open dazzling resorts in Florida. But whereas gambling like high-stakes poker is ubiquitous in Nevada, there are areas of Florida like Orlando, home to Walt Disney World, where Mouseketeers and one-armed bandits don't exactly mesh. "The state's just so diverse, so [a Vegas-style scenario] is not a natural progression," says state representative Bill Galvano, a Republican from the Gulf Coast who helped lead negotiations with the Seminoles. Adds state representative Jim Waldman, a South Florida Democrat who also took part in the Seminole deal: "I don't think you're going to have another Vegas. 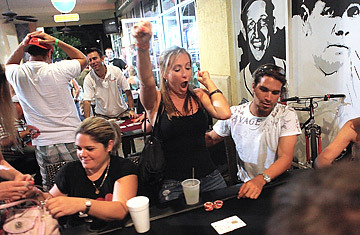 What you're going to have are more options for people who want to gamble" in Florida. Still, Pat Fowler, executive director of the Florida Council on Compulsive Gambling, says that since the state relaxed its poker rules, her group has seen a steady month-by-month increase in the percentage of people calling its help line (888-ADMIT-IT) for problems with blackjack and poker. "We don't know [yet] what the social costs of [the new] policy are," says Fowler, whose organization receives $1.75 million a year from the Seminoles for gambling-addiction treatment under the new deal. Meanwhile, high-roller tourists are flocking to Florida. Hayden Perez, 34, from Lincoln, Neb., recently played a no-limit cash game at the Seminole Hard Rock that didn't go so well. "I'm not buying dinner for my friends right now, let's put it that way," says Perez, who wouldn't say how much he lost. Perhaps he should check out Mizrachi's "Deep Stacks Live" poker-instruction course, which the Florida champ is hoping to expand now that the sky's the limit in his home state. Mizrachi says other poker pros have told him they've decided to relocate to South Florida. After taking a break from an all-night game session, he simply says that Florida "is a great place to play poker." See the best business deals of 2010.